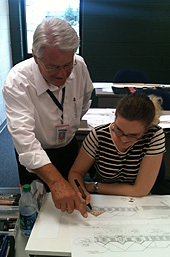 Training students to work with clients and complete real-world projects are the goals of TCC’s Interior Design program. Last summer students took learning to the next level when they were invited to do the exterior renderings and floor plans for this year’s Homearama to be held in the Edinburgh development in Chesapeake Oct. 19 – Nov. 3. Students set up shop in the Interior Design spaces in the academic building on the Chesapeake Campus. They used artist markers and colored pencils to draw the seven featured homes. The drawings included finishing touches such as landscaping, walkways and blue skies. Participating students included: Margaret Andrews, Clara Britton, Shaunette Howard, Jill Johnson, Naomi Jones, Patrick Keane, Nagila Kimball, Nichole Massey, Tawanda Mayo, Jeanisha Phillips, Esther Pinner, Kathryn Ray, Theresa Rozier, Courtney Sheldon, Liezel Soloman, Catherine Stelman, Akisha Wheeler and Christopher White.